I’m starting to declutter. I realized that I have way too many cookbooks…maybe more than 50? Most of these exist because I read recipes for relaxation and when I go on a trip, I often pick up a cooking magazine for the road. And if I go to a country with cuisine that is unfamiliar to me, I usually buy a book of local cuisine to try back home. Of course this doesn’t always work out because recently I bought a book on Greek cooking from our family holiday in Greece and I almost instantly regretted it because every recipe was loaded with carbs. Unless you eat only the roasted meats and fresh salads, I figured that most Greek food is actually made with lots of flour, starchy vegetables and rice. So I’ve put that cookbook aside because it’s already hard enough trying to figure out how to make Asian food low carb-friendly, it is too much work trying to do the same for a cuisine I’m not familiar with. Chinese food is generally high in carbs too. However, in certain dishes it is actually possible and fairly easy to make low carb. Take for example noodle soups. I’ve been able to make beef and chicken noodle soups low carb by doing simple substitutions e.g. Shirataki noodles for the noodles. Certain noodle soups are hard to adapt however e.g. Mee Siam and Mee Soto are both very sweet and Mee Soto is very starchy. So I usually focus on tweaking the clear soup-based dishes. Chinese soups are usually very flavour-intense. Most take hours of simmering on the stove. 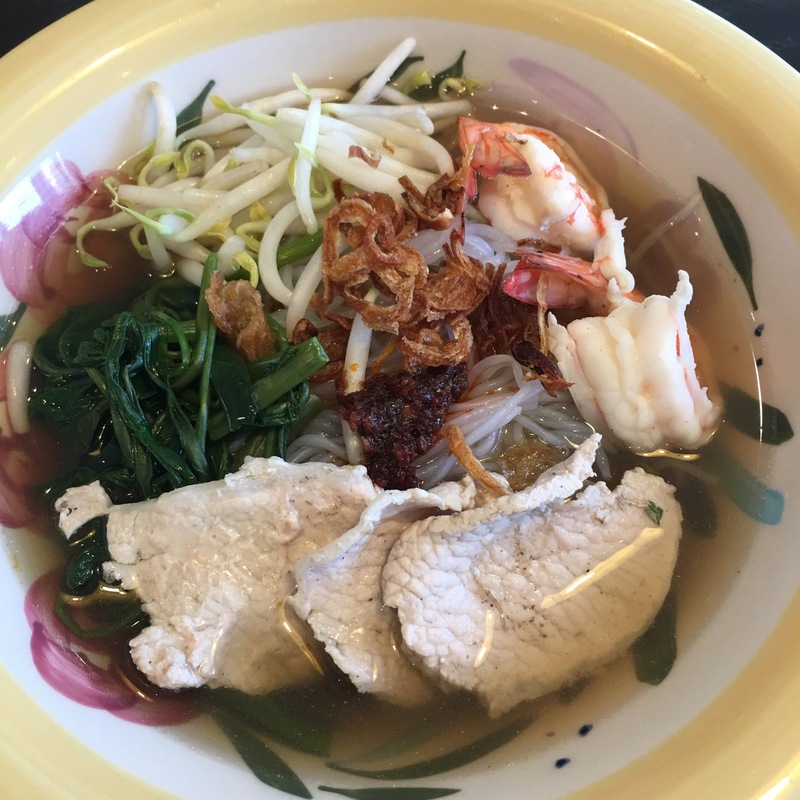 The broth of this prawn noodle soup is painstakingly made firstly by frying prawn heads and shells and then stewing these heads with pork bones. Some traditionalists even grind up the prawn shells to intensify the flavour. In this day and age where we all multitask and run multiple consecutive errands, pressure cooking has been a life-saver and I’ve been sneakily amused to discover that my favourite Chinese restaurant uses a pressure cooker to braise meats and make stock. So I’m entirely unapologetic about making this traditional Hokkien Prawn mee soup in my much loved Instant Pot. I love that the Instant Pot makes this a neat and clean exercise and I can walk away from the pot and do other stuff while it does it’s magic. The Instant Pot made the prawn stock base followed by the rich pork bone stock that was sweetened with carrots and daikon radish. And it was perfect in keeping the broth neatly simmering till my guests were ready to eat. At the end, this recipe is good for a small crowd. The broth is just ladled on noodles and some meat and vegetables, and makes a flavorful and hearty meal. Self help station for a hearty prawn noodle breakfast. Put the Instant Pot into sauté mode and heat up the oil. Sauté the prawn heads and shells and spring onions for about 5 minutes. Add the garlic and briefly stir fry for 1 minute. It is important not to burn the garlic or the stock will be bitter. Add the water, making sure that the prawn shells are fully immersed. Turn off the sauté mode and put the lid on with the vent in the sealed position. Put on manual pressure cooker mode for 30 minutes. In the meantime, bring a pot of water to the boil, then blanch the pork bones for 5 minutes, then remove and set aside. When the prawn stock is done, do a quick pressure release, then strain the stock, discarding the solids. There may be some scum on the surface and this should be skimmed off. Put the prawn stock back into the pot and add the pork bones, carrots, daikon, salt, pepper, soy sauce, fish sauce and Shao Xing wine. Add water (about 6-8 cups) up to the 4L mark on the inner pot. Seal the pot again and put on manual high pressure for 1 hour. When done, drain the stock and discard the solids. I usually refrigerate the stock overnight and discard the solidified fat. If not, just skim off the top layer of oil that has formed. Put the stock back into the Instant Pot and put into sauté mode. Poach the pork loin slices, then set aside. Poach the prawns, then set aside. 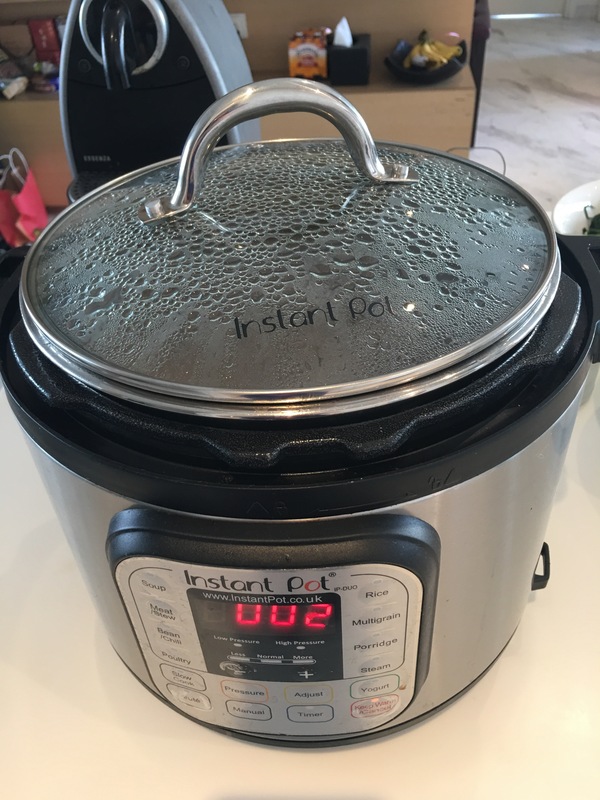 Once done, you can put the Instant Pot into the “keep warm” mode until ready to serve. In another boiling pot of water, blanch the bean sprouts, then set aside. In the same pot, blanch the Kang Kong vegetables and set aside. 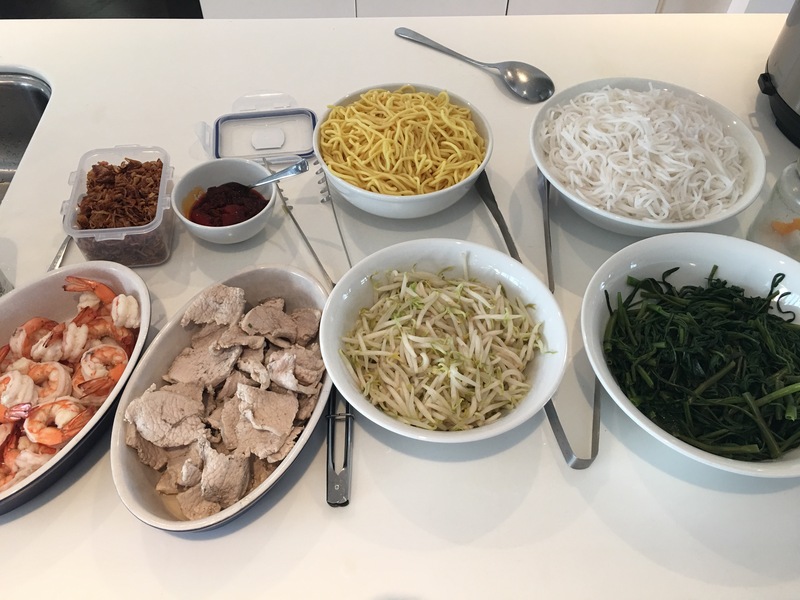 When ready to serve, place a handful of noodles into a bowl and top with several slices of pork loin, 2-3 prawns, bean sprouts and Kang kong. Pour several ladles of the soup stock over the noodles. Garnish with shallots and sambal belachan. Serve hot.